NEW DELHI: Describing India as a “messenger of peace,” Prime Minister Narendra Modi on Sunday said the country has always contributed towards global peace, unity and harmony through U.N. missions across the world. He said India is the third highest contributor to U.N. peacekeeping missions, with around 7,000 of its security personnel deployed on various missions across the world. In his 30-minute broadcast, he also talked about India’s tradition of respecting the nature through festivals like “Chhat” and referred to the ongoing cleanliness campaign. He mentioned the role played by Sardar Vallabhai Patel in laying the foundation of the country’s unity and urged people to participate in the “Run for Unity” to be organised on the late leader’s birth anniversary on October 31, which also happens to be the death anniversary of Indira Gandhi. Talking about the upcoming Children’s Day which is celebrated on the birth anniversary of Jawaharlal Nehru on November 14, Mr. Modi expressed concern that children are nowadays getting afflicted by diabetes. He also spoke about the upcoming Guru Nanak Jayanti which falls on November 4 and hailed the first Sikh Guru, describing him as a “world guru” who thought about the welfare of the entire humanity. Describing it as an “unforgettable” experience, he lauded the “struggle, dedication and sacrifices” of the armed forces who work in extremely difficult conditions at the borders to protect the country. He said the Indian forces are deployed not only on the borders but play a role to establish peace across the world in the form of U.N. peacekeeper and make the country proud. Referring to the U.N. Day celebrated on October 24, he said it is an occasion to remember the efforts of the U.N. to establish peace in the world. “We are believers of ‘vasudhaiva kutumbakam,’ which means the whole world is one. And because of this belief, India has been an active participant in the U.N.’s key initiatives,” Mr. Modi said. He said as of August 2017, India has participated in about 50 out of 71 U.N. peacekeeping operations undertaken in countries like Korea, Cambodia, Laos, Vietnam, Congo, Cyprus, Liberia, Lebanon and Sudan. Indian women personnel too have contributed in this endeavour in an active manner. In Congo and South Sudan, hospitals run by Indian armed forces have treated over 20,000 people and saved most of them. Not only have the Indian troops saved the people of those countries, but also conducted people-friendly operations. “The brave soldiers from the land of Mahatma Gandhi and Gautam Buddha have spread the message of peace and harmony across the world,” Mr. Modi said. He added that the U.N. Declaration of Human Rights had initially the wording ‘all men are born free and equal,’ but it was changed to ‘all human beings are born free and equal’ after efforts by Indian representative Hansa Mehta. This, he said, was to ensure respect for women. During the programme, Mr. Modi also talked about Sister Nivedita, an Irish lady whose original name was Margaret Elizabeth Nobel, and recounted her service to the Indian people during the British rule. “Sister Nivedita was deeply hurt by the atrocities committed during the British rule. The British had not only made us a colony, but also tried to enslave us mentally. They continuously tried to deride our culture to create an inferiority complex among us,” he said. He also said that khadi sale at just one outlet in Delhi on the last Dhanteras on October 17 was a record ₹1.2 crore. 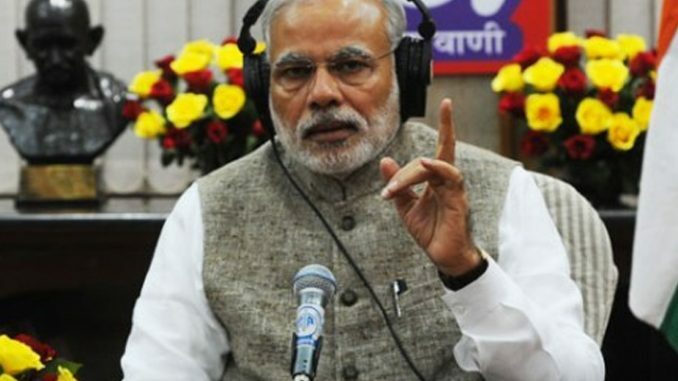 “The ‘Mann Ki Baat’ [programme] is praised and sometimes it is criticised. But when I see the impact of ‘Mann Ki Baat,’ my belief becomes a conviction that the programme has forged an unbreakable bonding with the people,” Mr. Modi said. He said an example in this regard was the sale of khadi and handloom, which he had been advocating strongly through the “Mann Ki Baat” programme. The sale of khadi and handloom witnessed 90% increase during this Diwali against the previous year’s figure, the Prime Minister said. The Prime Minister also referred to some recent sports events like the Asia Cup Hockey and Denmark Open Tennis tournament. He hailed India’s victory in the Asia Cup after 10 years and lauded K. Srikanth for winning the Denmark Open after Indonesia Open and Australia Open.